6 cottages; peaceful lake; personal hot tubs, saunas, Jacuzzis, water trampoline, kayaks, canoes, paddle boats, fireplaces, AC, DVD players, wireless internet & more all at no extra cost. 4 for 3 and 3 for 2 Specials even in summer high season. A few openings for early half of July Click here to see vacancies. Luxurious cottage on Ivanhoe Lake near Timmins. 5 bedrooms with ensuites, great room, 2 fireplaces, shuffleboard, pool table, sauna, whirlpool. 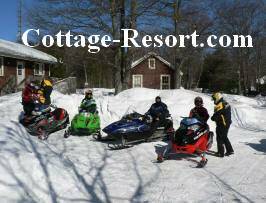 All winter sports, snowmobile rentals. 15 great lakeside accommodation choices for your perfect Winter getaway. Ski, Skate, Slide, Ice fish or Sled, whatever your winter activity, North Muskoka can accommodate you!